SUNSET BEACH, Oahu/Hawaii - Australian Adam Melling, from Lennox Head NSW, has won the US$250,000 VANS World Cup of Surfing at Sunset Beach, Hawaii – exactly what he needed to retain a position on the ASP World Tour for 2013. 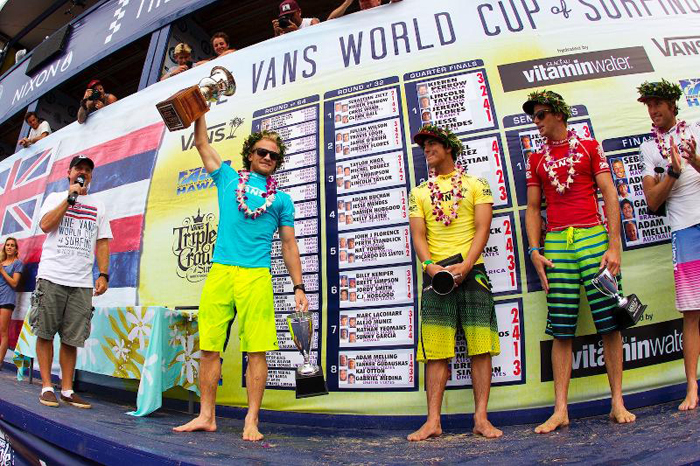 Melling, 27, won US$40,000 and moved to equal second on the VANS Triple Crown series ratings. Melling found himself in the final against Sebastien Zietz (Kauai) – the recent winner of the REEF Hawaiian Pro (the first stop of the $1million Vans Triple Crown of Surfing); Brazilian wunderkind Gabriel Medina; and fellow Australian Adrian “Ace” Buchan (Central Coast, NSW). He was up against the wall, knowing he needed a win or a second to get the points he needed to requalify. Zietz ran away with an early lead after a 7.67 tube ride. Melling was afraid he had peaked too soon, surfing “the perfect heat” in the quarter finals that earned him the highest score of the entire competition: 18.4 points out of 20 (9.4 & 9.0 wave scores). But glassy smooth 6-8 foot surf prevailed and so did Melling’s powerful level of performance. Digging deep, he turned the tables on Zietz just minutes before the close with a near-perfect ride (9.33) that featured four gouging turns. He shot from third to first. But with seconds remaining, Medina paddled into a game changer, got barreled and cleanly exited. Melling was left floating, waiting for Medina’s score to drop… not enough to steal the win, but enough to take second, relegating Zietz to third and Buchan to fourth. “Waking up this morning I was like, this comp is going to be over today and I really want to be on that podium,” said Melling, who surfed a total of four heats today. “Pretty glad that I loaded myself with a lot of breakfast and just hit the vitaminwater after each heat to keep a bit of energy in me. “I don’t know why it comes to this but on tour it’s definitely hard. It’s only 32 guys and they want it so bad and they all surf so good. Some of the smaller seeds come into play in heats especially man on man. I haven’t had too much luck this year but felt like my surfing’s been the best it’s ever been, so hopefully I don’t put myself in this position ever again. “I like power surfing and I think that’s definitely one of my strengths. Coming out here you can push as hard as you want because those boards are pretty big so you get out there and push hard. A lot of Aussie surfers can do that stuff so it’s good. For Kauai boy Zietz, 24, the moment was still a sweet one despite missing the win. One of only a handful of surfers to ever make back-to-back finals in 30 years of the Vans Triple Crown, Zietz leads the Triple Crown ratings and that gives him a wildcard into the ultimate event: The Billabong Pipe Masters (Dec. 8-20). He is also incredibly close to clinching the $100,000 Triple Crown cash bonus. Melling or Alejo Muniz (BRA), tied for second on the Triple Crown ratings, would need to place third or better at Pipe, with Zietz losing first round, for Zietz to lose the title. In addition to the cash, Zietz could walk away with a $30,000 Harley Davidson motorcycle, and a $10,000 custom Nixon watch. “I saw Melling get that wave and I already knew it was the score,” recounted Zietz. “He blew it up super hard and I knew he only needed a six. But I’m still super happy, Melling is a friend of mine and I’m stoked that he won it. I’m still over the moon. I have two finals in a row and I can’t ask for much more. Also awarded today, the JN Automotive Rookie of the VANS Triple Crown, to the top newcomer to this prestigious series. It was awarded to Koa Smith (Kauai). Equal fifth after semi-final losses today were Perth Standlick (AUS) and Jesse Mendes (BRA). Equal seventh after the semi’s were Alejo Muniz (BRA) and Lincoln Taylor (AUS). The Vans Triple Crown of Surfing, hydrated by vitaminwater, now moves to the Banzai Pipeline for the third and final stage of the series. The first potential day of competition is Saturday, December 8. The Vans Triple Crown of Surfing is made possible with the support of: vitaminwater; Nixon; Skullcandy; GoPro; Turtle Bay Resort; Clif Bar; Mauli Ola Foundation; wavejet; the Association of Surfing Professionals; JN Automotive Group; Hawaii Tourism Authority; Oahu Visitors Bureau; Surfline.com; Surfing Magazine; Hawaiian Airlines; truth®; Oceanic Time Warner Cable. =4. Gabriel Medina (BRA) 6,500.